November 30, 2004: Ken Jennings make Jeopardy! history when he finally loses during his 75th game after winning $2,522,700. He went on to win another $500,000 on the Ultimate Tournament of Champions for the 2004 season. Jeopardy! is an internationally televised game of answers and questions. Three contestants vie for top earnings giving the proper questions to the answers provided. Jeopardy! entered it’s twentieth season in 2003 and at that time changed the rule concerning returning champions. Prior to 2003 the limit was five appearances after which the champion was retired and three new contestants would begin play the next show. Jennings was born in Edmonds, Washington but grew up in Seoul, South Korea and Singapore. He is a Mormon and served two years of missionary work in Madrid, Spain. He worked as a software programmer and also wrote and edited questions for the National Academic Quiz Tournaments. Jennings said he practiced for the show by reading, watching the televised program, making flashcards, and practicing using the buzzer. In fact, he has said that it is the buzzer that makes or breaks the contestants. If you ring too soon, you are blocked out for a short time and if you wait too long a competitor has won the right to give the question. The longer he was on the show, the more time the new contestants were given to practice using the buzzer to help offset this advantage. Jennings began his run on the quiz show on June 2, 2004 and continued through 74 wins that spanned two seasons. He worked in Utah and flew to California where the show is taped every other week for two days, Tuesday and Wednesday. He finally lost to Nancy Zerg when he missed a Daily Double and then Final Jeopardy for a loss of $10,400. The Final Jeopardy business answer he missed was H&R Block, giving the wrong question as FedEx. Both companies used him as a spokesperson soon after his loss. Also on this day, in 1934 the Flying Scotsman reaches speeds of 100 mph. Also on this day, in 1877 Thomas Alva Edison demonstrated the phonograph. November 28, 2000: The eighth drop in The Pitch Experiment falls. Professor Thomas Parnell began the experiment in 1927 at the University of Queensland in Brisbane, Australia. The goal of the experiment was to show that some substances that appear to be solids are in fact, liquid. Pitch is a viscous, slow-moving liquid, usually bitumen. 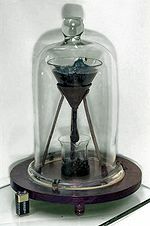 Tar pitch flows at room temperature. Slowly. Very, very slowly. The pitch was placed in a sealed funnel by Professor Parnell and then allowed to settle. Three years later, it was deemed to have settled and the tip of the funnel was opened and the liquid was now allowed to flow. It eventually formed a drop that fell into the receptacle beneath. Pitch will shatter when struck with a hammer, seeming solid, but it flows as a liquid. There were no controls set and the flow of the liquid remains affected by temperature. The first drop fell during December of 1938, the second in February 1947. Professor Parnell died in 1948 and the experiment came under the supervision of John Mainstone. The next drops fell April 1954, May 1962, August 1970, April 1979, July 1988, and finally November 2000. No one has ever seen a drop actually fall. There was a webcam set up filming the experiment in 2000, but it malfunctioned at the critical time. Parnell and Mainstone were awarded the Ig Nobel Prize, a parody of the Nobel Prize, which is awarded for efforts that at first seem silly and yet eventually make you think. Mainstone accepted the award. He has since stated that there is enough pitch for the experiment to continue for at least another 100 years, if someone can watch over it. Not exactly a time-consuming task. Back when the experiment was set up, it was not considered that the rooms would be air conditioned. They have been. The last drop was the largest drop ever seen and the receptacle was not of sufficient size for it to allow for the drop to entirely break from the funnel. There does need to be some modifications. The tests seem silly, but they have given help to the study of viscosity and shown that pitch is 100 billion times more viscous than water. Also on this day, in 1942 the Cocoanut Grove fire destroys the nightclub and kills 492 patrons. November 27, 1095: Pope Urban II, in a speech given at the Council of Clermont in France, calls for Christian princes in Europe to rescue the Holy Lands, especially Jerusalem, from the Turks. Muslims had ruled Jerusalem since 638 but had allowed Christian pilgrims access to the Holy City. By the 11th century Seljuk Turks had taken over rule in the area and Christians were no longer given free passage to Jerusalem, nor safety while in pilgrimage. 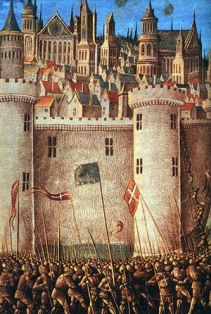 There were several Crusades to free the Holy City from Muslim control. They are arbitrarily divided into anywhere from seven to twelve waves. The dates given are definite in the starting point with 1095 the beginning, ending dates vary. Usually the end of the 13th century is given, however Crusades continued with the last in 1669 by the Duke of Burgundy from Candia. The First Crusade was divided into three waves. The People’s Crusade in which 100,000 peasants and lowly knights were led by the charismatic and inflammatory Peter the Hermit of Amiens. These peasants fought along the way with about one-quarter dying in battles before reaching the Holy Lands where the rest died in unskilled fighting. The German Crusade was marred by the anti-Semitism that was already a part of life. They enacted pogroms against both resident Jews and Muslims, to the Pope’s dismay. The Princes Crusade was a group of 7,000 titled men who came without supplies to fight in the desert where many died of heat and thirst. The 1,500 survivors made their way to Jerusalem where they took control of the city in 1099 by murdering or capturing nearly all the inhabitants. The Crusades overall were unsuccessful. They did not take lasting control of the Holy Lands, they increased the antipathy between Latin and Greek Christians and actually brought about the disintegration of the Eastern Empire, they were marred by anti-Semitism, and they fostered the hatred between Christian and Muslim that lives on to this day. Also on this day, in 1978 George Mascone and Harvey Milk were murdered. 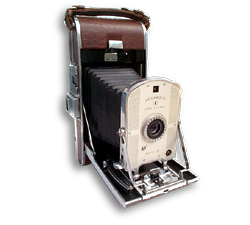 November 26, 1948: The first instant camera, the Polaroid Land Model 95, sells for $89.75 ( about $865.00 in 2009 USD) at the Boston, Massachusetts Jordan Marsh department store. The camera produced a 3.25 by 4.25 inch dry print. These early cameras used roll film; in 1963 peel-apart pack film came into use. The term “photography” was first used in 1839 by John F.W. Herschel, combing the Greek “photo” for light and “graph” for to draw. In the summer of 1827 Joseph Nicéphore Niépce took eight hours to produce the first lasting photographic image. By 1839 Louis Jacques Mandé Daguerre was producing lasting pictures in less than thirty minutes. Daguerreotypes could not be copied, the pictures were one of a kind. William Henry Talbot invented the negative to positive process in 1841, making it possible to create copies of pictures. Frederick Scott Archer came up with a Collodon process in 1851 that took the time down to 3 seconds for creating a picture. But the negative needed immediate developing. So in 1871, the next step was taken by Richard Leach Maddox and development of the film could be delayed. Celluloid film was brought to market in 1898 by Hannibal Goodwin and mass produced Kodak Brownie cameras came on the scene in 1900. Kodacolor film was introduced by Kodak in 1941. Polaroid brought the largest patent lawsuit against Kodak on April 26, 1976 citing several patent infringements. Polaroid held many of the patents for the instant photography method. After five years of pre-trial preparation and a 75 day trail, Kodak was found to be in violation concerning 12 patents held by Polaroid. Kodak was forced to remove its camera from the market and could no longer make film for existing cameras. They not only lost the case, but compensated Kodak Instant Camera owners whose cameras were now useless without the film. Also on this day, in 1917 the National Hockey League was founded. 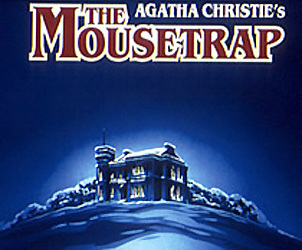 November 25, 1952: The Mousetrap by Agatha Christie is first produced on stage, the longest running play in London, still running today. The cast of characters is limited to eight, with a reference to the first murder victim. The cast gathers at Monkswell Manor and each in turn is considered to be the murderer of Maureen Lyon in London. Mrs. Boyle proves her innocence by being the next victim, also proving the murderer is present. The classic whodunit continues to enthrall after more than fifty years on stage. Agatha Mary Clarrisa Miller married twice, first was Colonel Christie with whom she had a daughter. During December 1926 Ms. Christie disappeared for ten days to much fanfare in the press. Was this a publicity stunt or was it in fact due to PTSD? Was she suffering a temporary amnesia after the death of her mother and the revealed infidelity of her husband? She married Sir Max Mallowen, an archeologist, after her divorce. The marriage was initially happy, but eventually it, too, devolved into infidelity. Christie was a prolific author. She is listed in The Guinness Book of Records as the best-selling fiction author with only the Bible and Shakespeare outselling her works. She has sold at least 1 billion copies of her work in English and another 1 billion in the 45 languages into which her works have been translated. She had written over 80 novels with 39 of them starring Hercule Poirot, the Belgian detective, and another 15 with Miss Marple solving crimes. She also authored four non-fiction books. She wrote seven romances under the name of Mary Westmacott. She wrote 25 plays, 4 radio plays, 1 television play, along with 222 short stories in 21 collections. Her tales have been adapted into 25 movies, 44 TV movies, and a TV series. There is even a video game. She died peacefully in her sleep at the age of 85 after suffering from a cold. Also on this day, in 1984 Band Aid records Do They Know it’s Christmas. 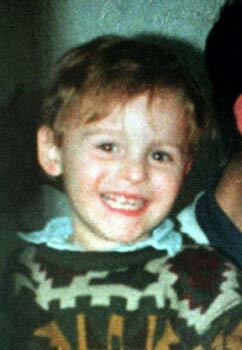 November 24, 1993: Jon Venables and Robert Thompson are found guilty of the murder of James Bulger. Two-year-old Jamie was at the mall with his mother when she left him standing outside a shop for a few minutes. Jon and Robert, both ten, took his hand and walked him from the mall. This was caught on closed circuit TV timed at 3:39 PM. The three boys walked 2.5 miles to an isolated railway bed. On the way, the group stopped at a canal where Jamie was dropped and sustained injuries to his face and head. The group walked on passing an incredible 38 people on the way. Some stopped them and were told that the older boys were babysitting a younger brother, some were told that the small boy was lost and the group was on the way to the police. Some claimed the child looked happy while others noted the injuries and said he looked distressed. All let the boys carry on. The older boys threw blue paint in Jamie’s face. They kicked him and struck him repeatedly with bricks, stones, and a 22 pound iron rod. After he was dead, they placed his body over the railroad tracks and weighed down his head. They thought that if a train ran over him that traces of violence would be thought to be from the accident. The pathologist was not fooled. At their trial it was stated that both boys were from violent families plagued by alcoholism and abuse. It was also brought forth that they had been watching violent movies. They did not take the stand in their own defense. They were found guilty and sentenced to a young offenders institution at Her Majesty’s Pleasure rather than a life sentence. The minimum term to be served was eight years. Both young men were released after spending eight years in prison with life license, meaning that they will be sent back to prison if they break the terms of their release. The British government has spent about £4 million helping the young men build their lives and hide their identities after their release. Jamie’s mother received £7,500 criminal compensation from the government. Also on this day, in 1971 Dan or D.B. Cooper jumped from a plane after collecting ransom money. 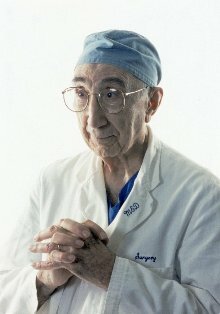 November 23, 1964: Dr. Michael E. DeBakey performs the first successful coronary artery bypass graft [CABG] operation. DeBakey was born in Lake Charles, Louisiana, USA in 1908 to Lebanese immigrants. He received his MD from Tulane University in New Orleans and joined their teaching staff in 1937. He volunteered to serve in World War II and became the Director of Surgical Consultants’ Division. He initiated the idea of Mobile Army Surgical Hospitals [MASH] for rapid treatment of the wounded. The idea proved highly successful in Korea and again in Vietnam. After WWII, DeBakey moved to Houston, Texas and Baylor University College of Medicine. He continued his innovative practice and groundbreaking research. He invented or improved surgical instrumentation that even today bears his name. He pioneered the use of Dacron arteries, artificial hearts, heart pumps and transplants as well as surgical improvement for the vascular condition of the heart. He has been advisor to presidents and world leaders and helped to establish the largest collection of medical literature in the National Library of Medicine. In the year 2003, in the US alone more than 1.2 million angioplasties were performed. This less invasive procedure opens the arteries in the heart and can forestall the more invasive CABG that Dr. DeBakey pioneered. Even so, the more serious surgical procedure was performed nearly one-half million times in the same year. Also on this day, in 1644 John Milton published a pamphlet advocating against censorship. November 22, 1718: Lt. Robert Maynard chases down and kills the notorious pirate Blackbeard. Edward Teach was born around 1680 in England, probably Bristol. He began his seafaring life during the War of Spanish Succession in Jamaica. He joined forces with another pirate, Benjamin Hornigold in 1716. Teach was a large man with a bushy black beard. He wove hemp into his beard and lit it on fire while approaching ships. The terrifying specter was often enough to forestall any form of resistance. 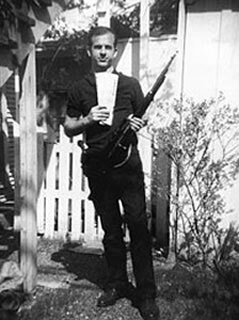 He was a scary person with legends that were bandied about even in his own time. He is said to have shot and killed one of his own crew just to remind the rest of the crew who was boss. Teach made captain in the pirate fleet when he overtook a French slave ship, Le Concorde. She was a two-ton frigate with 20 cannons. Teach refitted her with another 20 cannons and rechristened her the Queen Anne’s Revenge. He eventually commanded four ships with over 300 pirates under his control. He stayed along the coastlines and in the estuaries because the shallow waters made it harder to defend against his superior strength. In May 1718, the Queen Anne foundered and was lost. Blackbeard had homes in Nassau and in North Carolina where payoffs to the governor, Charles Eden, kept him safer. However, the British were not amused with the piracy and eventually Lt. Maynard led the attack, bringing Blackbeard down with five gunshots and over 20 cuts from swords. Blackbeard was beheaded as proof of his demise in order to collect the £100 reward. His head was hung from the bowsprit for bravado and place on a pike in Bath, England as a warning. Also on this day, in 1928 Bolero by Maurice Ravel was first performed. November 21, 1953: A skull fragment, portion of jawbone, and a few teeth that had been discovered in 1912-15 are declared to be a hoax. Throughout the last half of the 19th century there were many discoveries of ancient bones that spoke to the history of the evolution of mankind. 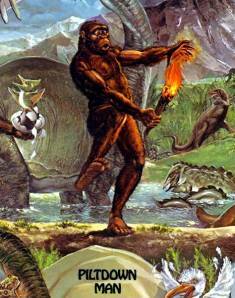 The Origin of Species was also published by Charles Darwin. Many discoveries were made in continental Europe and Asia, but nothing was found in England until 1912. At that time, Charles Dawson found the above mentioned bones and brought them to the attention of the Geological Society of London in December. Arthur Smith Woodward went to the Piltdown quarries in Sussex, England along with Dawson and discovered even more bone fragments. The finds were called Piltdown Man due to the location of the site. The skull fragments were similar to man but much smaller while the jaw and teeth were indistinguishable from modern chimpanzees. Even at the time, there was some doubt as to the efficacy of the find. Woodward and Martin A. C. Hinton, both officials in museums, found parts of bone at digs conducted with Dawson. The “missing link” between man and monkey was called Eoanthropus dawsoni for Dawson. Piltdown Man was memorialized in 1938 with a marker erected at the site. Dawson claimed to find Piltdown II at a site a couple of miles from the original, but no details remain and the site was never quite found. Who was the perpetrator of the hoax? Why do this? It is theorized that it may have been a practical joke that spun out of control. Was Dawson working alone? Did Woodward, Hinton, and Pierre Teilhard de Chardin [who also found a tooth at the first site] know what they were doing? Were the grounds salted or did these men plan the hoax? Even Sir Arthur Conan Doyle is named as a possible perpetrator. We don’t know who or why, but it is the perfect working of science after all. Even though at the beginning the “truth” was in error or misrepresented, due to diligent testing, study, and improved technologies, the hoax was eventually brought to light. Also on this day, in 1942 the opening of the Alaska Highway was celebrated at Soldier Station.